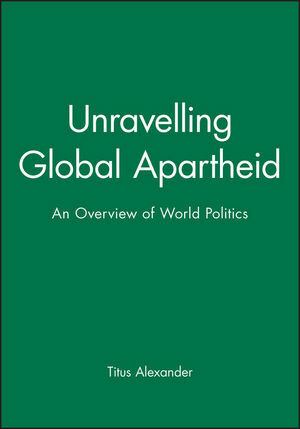 Unravelling Global Apartheid provides a clearly written overview of global problems as well as a vigorous analysis of the underlying causes and strategies for dealing with them. Titus Alexander is a community education worker who has taught current affairs and politics to adults for many years. Introduction: What is Global Apartheid and Why does it Matter?. 1. The World in One Country. 2. The Dynamics of Separate Development. 3. The Economics of Global Apartheid. 4. Global Privileges of Private Enterprise. 5. Managed Markets of Global Apartheid. 6. Institutions of Global Apartheid: The UN System. 7. The Laws of Exclusion. 8. The Western Alliance Government. 9. The West Knows Best: Values and Ideology of Global Apartheid. Includes a wide variety of factual documentation about global economic divisions.